Starting your own business can be an exciting venture. However, trying to start a business at a physical location can be overwhelming. Businesses that have physical locations require lots of research and legwork to get them off the ground. A better option is to start a small business online instead. Following are several reasons why starting an online business is a great idea. There is only a small amount of risk involved in starting a home-based Internet business. Brick and mortar businesses are far riskier because they require a high amount of overhead to start. People who start a business often need to dip into their savings, open a line of credit, or borrow money to get the capital required to start the business. Conversely, it takes almost nothing to start an online business. It is relatively easy to turn an extra room into a home office. The only money that is needed to start a home-based business is the cost of setting up a website. Running an online business from your home offers great flexibility. A business with a physical location requires that you be present during normal business hours. Having an Internet business allows you to make your own hours and change them on a daily basis if you choose. The earning potential for an online business is truly unlimited. It is easy to reach a large number of people in a short amount of time for a small amount of money. Some people who have home-based Internet businesses have been known to turn a small cottage industry into a million dollar company. Starting a small online business is a good way to teach yourself fiscal responsibility. It will also lead you on the path to financial independence. The amount of money that can be made through an Internet business is not dependent on the amount of time that is put in but rather taking advantages of the opportunities that are presented. As you begin to sell your product online, your profits will begin to grow. As time progresses, and the business continues to grow, it will become possible to expand to other avenues that can also create revenue. Before long, the increased streams of income will combine to create the financial independence you crave. Owning your own Internet business requires you to wear lots of hats. Although you probably already know a lot about the nitty-gritty of the business, you will have to learn the finer points of running a business. Some skills that can be gained include public relations and marketing techniques, basic accounting skills, and various social media advertising outlets. Every new skill you learn makes you a more marketable entrepreneur. Starting a small Internet company is a great way to achieve job security. Working for an employer at a company someone else owns is fraught with risks. There is always a chance of being laid off or downsized. Owning your own Internet company means you are the boss. There is no chance that you are going show up to work one day only to find out your services are no longer needed. Being the boss of your own small Internet company means you have the power to create jobs. In the current economy, this ability is a huge boon. Even if you only have the need for one or two associates, you are still providing work for someone who needs to have money to put food on the table. Just about everyone has had an experience with a co-worker they did not like. It is just one of the hazards of working for someone else. When someone else is calling the shots, you have no say in who gets hired. However, when you are running a small Internet-based business, you get to choose all of your coworkers since you are the boss. There are many tax benefits for people who start their own small Internet businesses. Since a large part of the business will be run out of the home, there are many daily expenses that can be written off as tax deductions. You can easily write off expenses such as travel, food, phone bills, and even part of your car payment just to name a few of the perks. Owning your own business can provide a satisfying sense of fulfillment. Succeeding in creating a business out of a passion can be incredibly rewarding. Having a successful home-based Internet business does not guarantee success; however, the chances of success are high. According to The U.S. Small Business Administration, approximately 70% of home-based Internet businesses survive for at least three years. Only 29% of non-home-based businesses succeed for the same amount of time. Starting your own small Internet-based business is a great idea for anyone who is looking to make a personal mark in the world. 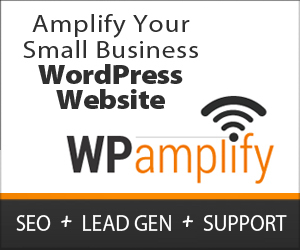 WP amplify has a proven three-step system that helps new entrepreneurs get started with their businesses. If you are ready to make the leap to owning your own Internet business, contact WP amplify to see how we can help you.